In economics, land has been traditionally assumed to be a fixed production factor, both in terms of quantity supplied and mobility, as opposed to capital and labor, which are usually considered to be mobile factors, at least to some extent. Yet, in the last decade, international investors have expressed an unexpected interest in farmland and in land-related investments, with the demand for land brusquely rising at an unprecedented pace. In spite of a fast-growing literature analyzing the variety of “spaces” affected by large-scale land acquisitions (LSLAs), the contemporary process of “commodification” of land embedded in this phenomenon has taken present day economists by surprise. 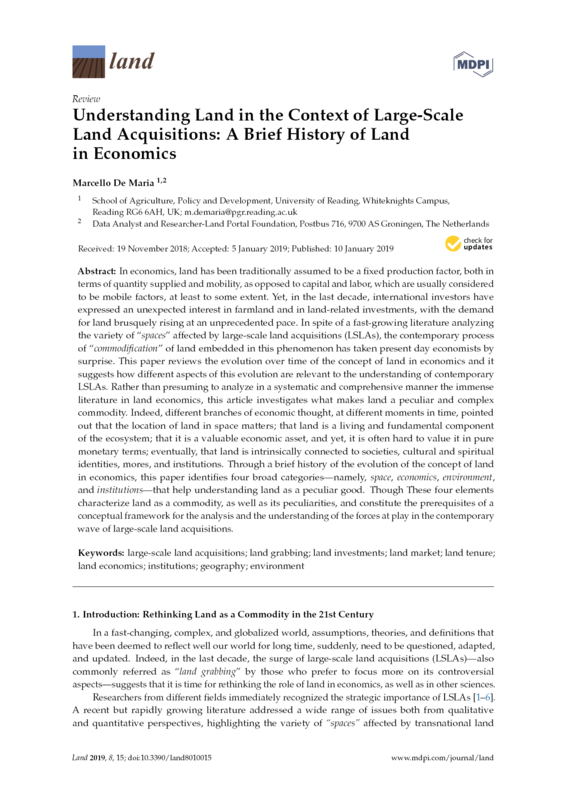 This paper reviews the evolution over time of the concept of land in economics and it suggests how different aspects of this evolution are relevant to the understanding of contemporary LSLAs. Rather than presuming to analyze in a systematic and comprehensive manner the immense literature in land economics, this article investigates what makes land a peculiar and complex commodity. Indeed, different branches of economic thought, at different moments in time, pointed out that the location of land in space matters; that land is a living and fundamental component of the ecosystem; that it is a valuable economic asset, and yet, it is often hard to value it in pure monetary terms; eventually, that land is intrinsically connected to societies, cultural and spiritual identities, mores, and institutions. Through a brief history of the evolution of the concept of land in economics, this paper identifies four broad categories—namely, space, economics, environment, and institutions—that help understanding land as a peculiar good. Though These four elements characterize land as a commodity, as well as its peculiarities, and constitute the prerequisites of a conceptual framework for the analysis and the understanding of the forces at play in the contemporary wave of large-scale land acquisitions.